"Dolphin Tale" Premiers September 23rd! According to the official synopsis, "Dolphin Tale is inspired by the amazing true story of a brave dolphin and the compassionate strangers who banded together to save her life. "Swimming free, a young dolphin is caught in a crab trap, severely damaging her tail. She is rescued and transported to the Clearwater Marine Hospital, where she is named Winter. But her fight for survival has just begun. Without a tail, Winter's prognosis is dire. It will take the expertise of a dedicated marine biologist, the ingenuity of a brilliant prosthetics doctor, and the unwavering devotion of a young boy to bring about a groundbreaking miracle--a miracle that might not only save Winter but could also help scores of people around the world. "The real Winter, who plays herself in Dolphin Tale, today serves as a symbol of courage, perseverance and hope to millions of people--both able and disabled--who have been touched by her remarkable story of recovery and rehabilitation." How's that for uplifting? News of Dolphin Tale's premier on September 23rd leaves me asking myself one huge question: How in the world did I NOT know this movie was being made? I began working as the Director of Education at Gulf World Marine Park in Panama City Beach, FL, in February 2006--two months after Winter was rescued and brought to the Clearwater Marine Aquarium, in Clearwater, FL. Because the marine mammal rehab world is so small, our staff watched Winter's rehabilitation and recovery like she was our own. Winter finally got her new tail in 2009, and although I had already moved on to my position at the Alaska Zoo at that time, I still celebrated like crazy. Here's a link to Winter's home, the Clearwater Marine Aquarium. 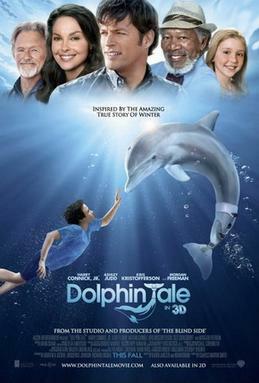 And here's a link to the movie's official site: Dolphin Tale Movie. Like most Hollywood movies, the storyline isn't exactly accurate, but the overall feeling of hope and inspiration definitely rings true. Here's a rundown of the real escue ("Winter the Dolphin's Rescue off Volusia has Hollywood Ending"), and here's a great article from CBS News that details plans for Winter's 2009 tail introduction ("'Bionic' Dolphin Getting New Tail"). Written by LisaAnn On August 31, 2011 In "clearwater marine aquarium", "dolphin rehabilitation", "dolphin tale", "lisa ann o'kane", "lisa ann okane", "morgan freeman", "movie", "premier", "september 23", "warner bros", "winter the dolphin"